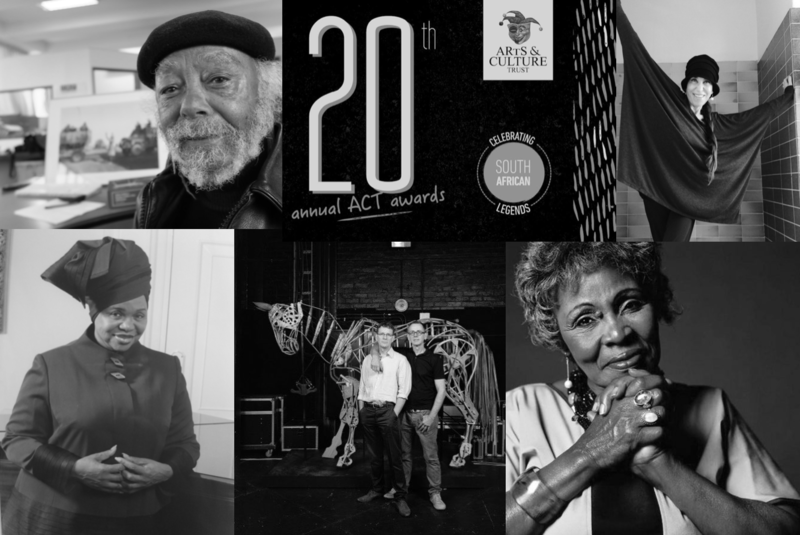 The Arts & Culture Trust (ACT) is pleased to announce that the 20th edition of the ACT Awards. The five winners of the ACT Lifetime Achievement Awards will each be interviewed by our phenomenal Emcee, KayaFM DJ Bridget Masinga. 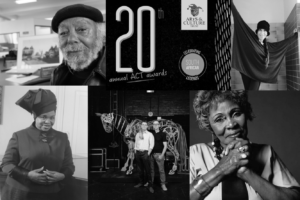 With just over a month to go before the 20th anniversary edition of The ACT Awards, which takes place at the Sun International Maslow Hotel in Sandton Johannesburg on the 17th November 2017, ACT is thrilled to be able to give our awards audience a first-hand account of the stories of our incredible Lifetime Achievement Award winners. On the evening, a total of six awards will be given out. This includes the five Lifetime Achievement Award winners listed below, as well as the announcement of the ImpACT award winner from our four finalists. Unlike the Lifetime Achievement Awards Winners, the ImpACT Award winner will only be revealed on the evening of the 17th of November 2017. “It is important to The Arts & Culture Trust to ensure that we keep pushing the arts and cultural landscape of South Africa forward by creating this pivotal space for recognition in the industry,” says ACT CEO, Marcus Desando. Therefore, the theme of this year’s awards is celebrating South African legends, and will pay tribute not only to the current Lifetime Achievement Award winners but also some of the great names that ACT has acknowledged over the years, such as Miriam Makeba, Johnny Clegg, Dr Mongane Wally Serote, Adv. Albie Sachs, Pieter-Dirk Uys, John Kani, Esther Mahlangu, Es’kia Mphahlele, Gibson Kente, David Koloane, Pops Mohamed, Sam Nzima and Nadine Gordimer to name a few. ACT is pleased to be able to briefly share in the significant accomplishments and hardships of this year’s winners as their stories serve as an inspiration and reminder of the importance of the arts and culture sector in South Africa, perhaps now more than ever. “Our hope is that the general public will grasp this opportunity to experience these South African legends tell their stories, as well as to be entertained by Bridget Masinga and Lira,” says ACT Marketing Manager and Fundraiser, Storm Jade Brown. Lindiwe Mabuza was born in 1939 to humble beginnings. She has achieved international renown for her work as a fierce advocate for the anti-apartheid movement and as the voice of the black woman through her collaborative poetry anthologies Malibongwe (1980) and One Never Knows: An Anthology of Black South African Women Writers in Exile (1989). She has served as Chief Representative for the African National Congress and is the recipient of several international graduate degrees, an honorary professorship, as well as the Order of Ikhamanga in Silver for her work in arts in culture with The Amandla Cultural Ensemble. The Arts Advocacy award is made possible by Creative Feel Magazine. Adele Blank is a dancer trained in the Cecchetti method of classical dance and she has contributed significantly to the industry as both a dancer and choreographer. Blank was choreographer for the 8+One Company, which was one of the first companies to feature a black dancer on the same platform as a white dancer. She was elected the Director of Dance and Choreography at Performing Arts Workshop, which later evolved into Free Flight Dance Company – now a leading professional dance company in South Africa. The Dance award is made possible by JT International. Basil Jones and Adrian Kohler of The Handspring Puppet Company met at Michaelis School of Fine Art in 1981. Their early work was based primarily on creating and carrying out a travelling theatre roadshow for schools in South Africa. After the State of Emergency was declared in 1985, Jones and Kohler began designing sets and puppets for children’s television and then went on to establish the not-for-profit company, The Handspring Trust. In addition, through The Handspring Trust they raised funding from international donors to make a multi-media science programme that was internationally lauded Today, they are best known for their ten-year collaboration with William Kentridge on productions such as Woyzeck on the Highveld, Faustus in Africa, Ubu and the Truth Commission, Il Rituron d’Ulisse and Confessions of a Zeno. In 2011, The Handspring Puppet Company collaborated with the Royal National Theatre of Great Britain and produced the now internationally famous War Horse. Today, they continue their outreach and community development programmes throughout South Africa and are the recipients of numerous arts and theatre awards, as well as an honorary D.Lit. from The University of Cape Town. The Visual Arts award is made possible by Nedbank Arts Affinity. Dorothy Masuku was already a top recording star by the tender age of 16, and left Zimbabwe to make it big in Johannesburg. During this period she wrote and performed the classic South African song Hamba Nontsokolo. From there, Masuku’s career continued to blossom as she was given many principal roles and solo performances accompanied by close-harmony groups and big bands. Her songs spoke to a moment of turbulence and hardship that was township life in apartheid South Africa in the 1950s and resonated. Due to this, she later fled South Africa and continued her political work through her music in places like Malawi, Tanzania, Zimbabwe, Zambia and even London. After the release of Nelson Mandela, Masuku returned to Johannesburg and took up her professional singing career once again. The Music award is made possible by South African Music Rights Organisation (SAMRO). James Matthews was born in 1929 in District Six, Cape Town. Despite gruelling apartheid circumstances and lack of a formal education, Matthews managed to publish his first writing at the age of 17 in 1946. From there he went on to work as a journalist and is best known for his political writing, which explored the reality of the working-class Cape Flats population under the Group Areas Act of apartheid law. Through his writing, Matthews became the leading voice of the Black Consciousness Philosophy and his works, including Cry Rage (co-authored by Gladys Thomas in 1972) were amongst the first to be banned. In 1976, Matthews was arrested and denied a passport. After his release he was more determined than ever and started publishing house BLAC (Black Literature, Culture and Society) as well as the first black-owned art gallery. Matthews’ writing has earned him international respect in Germany and Iowa in the United States. He is the recipient of an honorary Doctorate as well as a Governmental honour. Today, Matthews still lives in the Cape Flats where he actively promotes South African literature and engages in a variety of community projects. The Literature award is made possible by Dramatic, Artistic and Literary Rights Organisation (DALRO). Make sure that you get your tickets for the 20th edition of the ACT Awards. Tickets are available here (http://www.act.org.za/blog/act-awards-20-year-celebration-tickets/). The 20th annual ACT Awards is hosted by Sun International and is supported by the Southern African Music Rights Organisation (SAMRO), the Dramatic, Artistic and Literary Rights Organisation (DALRO), the Nedbank Arts Affinity, JTI, and Creative Feel Magazine. The Sun International Group has a diverse portfolio of assets including world class five star hotels, modern and well-located casinos, and some of the world’s premier resorts. Their destinations offer experiential luxury, enduring quality and incredible adventure, supported by an authentic dedication to personal service. Sun International Group’s approach has been to differentiate their hotels, resorts and casinos in architecture, service, experience, location and the mix of entertainment and activities. Creating lasting memories for their guests and customers is a core part of their DNA. They’ve created some the world’s most iconic hotels ranging from Times Square in Pretoria , to The Palace of the Lost City at Sun City and The Table Bay Hotel in Cape Town. The Group places a strong emphasis on being responsible corporate citizens through their contributions and commitment to the economy, communities and the environment. They are committed to the development of all their employees and they make sure that equal opportunities and economic empowerment form the backbone of their human resource practices. For more information, please click here. The Nedbank Arts Affinity is a proud supporter of the ACT. 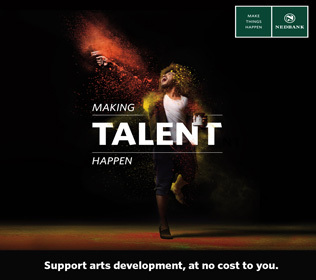 Since the inception of the ACT in 1994, Nedbank has raised and distributed more than R16 million through its Arts Affinity Programme, in support of more than 800 South African arts, culture and heritage development projects, at no cost to their clients. To open a Nedbank Arts Affinity account please visit any Nedbank branch or call 0860 555 111, or visit nedbank.co.za more information. DALRO is a multi-purpose copyright society that collects royalties for the use of copyright-protected works on behalf of authors and publishers, which it then distributes back to the correct copyright-owner. As a custodian of copyright and the protection of rightsholders’ works, DALRO’s main areas of administration are reprographic reproduction rights (photocopying from published editions), public performance rights (including stage rights for book musicals and dramas) and reproduction rights (whether for publishing or copying) in works of visual art. For more information, please click here. SAMRO was established in 1962, with the key objective to protect the intellectual property of its composer, songwriter, and publisher members, the organisation’s primary focus is to administer the various music rights of Copyright on behalf of writer and publisher members. The collecting society, as it is known, is mainly concerned with the collection of license fees for the use of its members’ musical works by various music users, the distribution of royalties to these members, and the promotion of Copyright law. Click here for more information. Japan Tobacco International (JTI) is a member of the Japan Tobacco Group of Companies (JT), a leading international tobacco product manufacturer. Headquartered in Geneva, JTI operates in 120 countries and has over 26,000 employees. For more information, please click here. Creative Feel Magazine is an award-winning monthly arts and culture magazine that brings the best in classical and jazz music, dance, visual arts, film and theatre, as well as food and travel, to its readers. The magazine is dedicated to promoting arts and culture in South Africa. Creative Feel Magazine has garnered many prestigious awards, including Arts & Culture Trust (ACT) Awards, as well as the SAPPI PICA Award for excellence in publishing and the coveted BASA (Business and Arts in South Africa) Award. For more information, please click here.